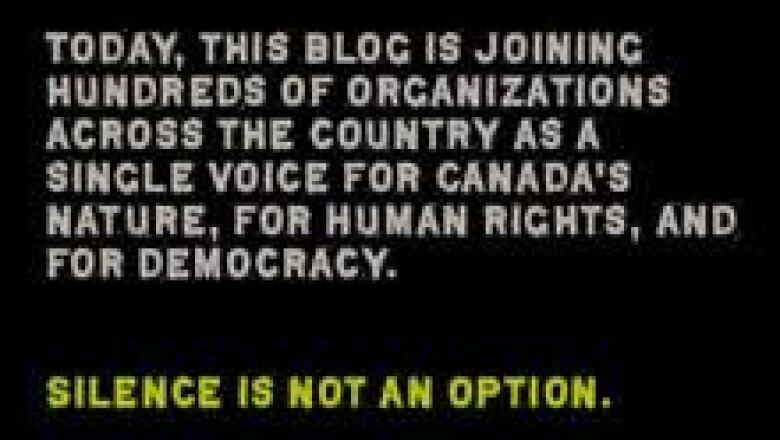 Organizers of a one-day website blackout say the Harper government is using its majority to force through environmental changes it never campaigned on, silencing its critics while it does the bidding of the oil industry. More than 500 websites went dark on Monday, as a coalition of environmental groups, corporations, church groups and other political commentators joined forces for an "unprecedented" protest of what they see as the government's effort to "silence" environmental voices using measures found in the omnibus budget implementation legislation. "Over one-third of [Bill] C-38's text is devoted to short-circuiting Canada's most important environmental laws," said Rick Smith, the executive director of Environmental Defence Canada. "Christmas came seven months early for the oil industry," he said, noting that what all the environmental measures in C-38 have in common is that they're "on the oil industry's wish list." "The government did not run with this as part of its platform. There was no mention during the election campaign," Smith told reporters. "You have got to attribute this to successful lobbying [by the] oil industry," Smith said. "In the wake of the Keystone XL decision" the industry "went like a bunch of crybabies to the federal government demanding that the government do something to push through pipeline projects at all costs," Smith suggested. 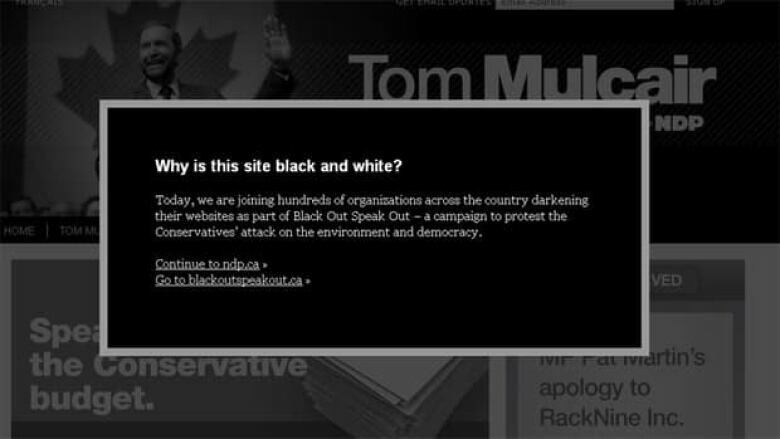 Some of the individuals and organizations darkening their sites Monday as part of the "Black Out, Speak Out" campaign included author Margaret Atwood, singers Bruce Cockburn and Sarah Harmer, the David Suzuki Foundation and the Sierra Club of Canada. Organizers believed more than 18,000 Canadians were participating, led by roughly a dozen environmental groups. Some completely pulled their websites for the day and replaced them with the campaign's message. Others, including those of the NDP, Liberal and Green parties, referenced the campaign prominently on their landing page and went with a black and white or greyed-out look for their regular site contents. The campaign website also includes darkened Facebook avatars and Twitter "twibbons" for profile pictures to encourage individual Canadians to support the campaign. Blackout organizers are concerned about the budget bill's measures to concentrate decision making around the cabinet table, while silencing voices from the research community previously positioned to provide balanced policy advice. Smith said this "retreat" from scientific research amounted to the government "poking out its own eyes." Not all of the participants in Monday's protest were accustomed to working together. Nor were they all previously active in political campaigns. Éric Hébert-Daly, the national executive director of the Canadian Parks and Wilderness Society, said joining this campaign was "unusual" for his organization, but "you can't just say nothing." Hébert-Daly noted that the government is planning for some $500 billion in resource development over the next decade or so. "In that context, we need stronger environmental regulation, not weaker ... you need to do more, not less." Do you think the protest will have an effect? Take our survey. Amnesty International joined four environmental groups at the Monday press conference to explain the blackout. Canadian secretary general Alex Neve said the Harper government had recently been exhibiting behaviour his organization documents in other countries as part of human rights advocacy efforts. "It's reflective of a deeply troubling pattern of intimidating, punishing, insulting, sidelining and ultimately seeking to silence voices of dissent and criticism in Canada," Neve said. Threatening environmental charities "because their advocacy is inconvenient" is "unconscionable," Neve said. Cutting off access to foreign funding or criminalizing foreign funding for civil society groups like environmental organizations is a "repressive tactic" used in countries like Ethiopia, Russia, or Zimbabwe, Neve said. And yet, the Harper government is acting "in that same vein," Amnesty International believes. As the websites went dark, Natural Resources Minister Joe Oliver and nine other cabinet ministers appeared at events across the country to promote the government's plan for "responsible resource development" — a reference to the environmental changes proposed in the budget bill. "There's a lot of exaggeration, distortion and outright falsehoods actually that are being expressed," Oliver told reporters at his event in Gatineau, Que. "I think it's important that we set the record straight." "Bringing our regulatory system into the 21st century will strengthen investor protection, rather than gut it. It will generate significant jobs and economic growth, rather than hollow out the economy," Oliver continued. "It's important for Canadians to hear the other side of the story and that's why we're doing it," the natural resources minister said. Liberal Leader Bob Rae called the co-ordinated cabinet media events a "truly Orwellian moment, when cabinet ministers are fanning out across the country to talk about what a wonderful job the Conservatives are doing on the environment, which is a tragic farce." "This government attempts to shut down and intimidate its critics," Rae said at a morning press conference to draw attention to the campaign. "And we all have to stand up and speak out." "Anyone who speaks out against Mr. Harper is told to sit down and shut up and Canadians should be asking who is next," added Liberal environment critic Kirsty Duncan. "Silence is not an option." NDP environment critic and deputy leader Megan Leslie, told CBC News on Sunday that the study of part three of the budget bill (which includes the environment changes) was "rammed through" the subcommittee tasked to review it, where witnesses were "rushed" and "attacked" by Conservative members. "It was disgraceful. This was absolutely not democracy," Leslie said. The NDP is expected to write a strong dissenting report on the committee's review. Environment Minister Peter Kent dismissed concerns raised by Leslie in Monday's question period as "sanctimonious twaddle." The Green Party and its leader Elizabeth May are also part of the online campaign, as is the Bloc Québécois. "There has been a recent chill due to smear campaigns. When environmental groups are demonized as 'radical' or 'against Canada,' we stand with them," read a statement issued by May late on Sunday. "If protecting nature, wilderness and our kids' future means our own government can attack us as 'radical,' then all Canadians must be radical." May is working with the Liberals on an attempt to introduce over 200 amendments to the budget bill when it returns to the House of Commons at report stage, a parliamentary tactic that threatens to tie up proceedings with more than 50 hours of consecutive votes. "We're always open to improvements, but if people are wanting to gut the legislative change we're not going to be impressed by that," Oliver told reporters Monday morning. "When people talk about lack of free speech and lack of democracy ... this is over-the-top rhetoric that is not substantiated by the facts," he said. "We're willing to have a rational argument but it's got to be fact-based." Do website protests like Black Out, Speak Out have any effect?